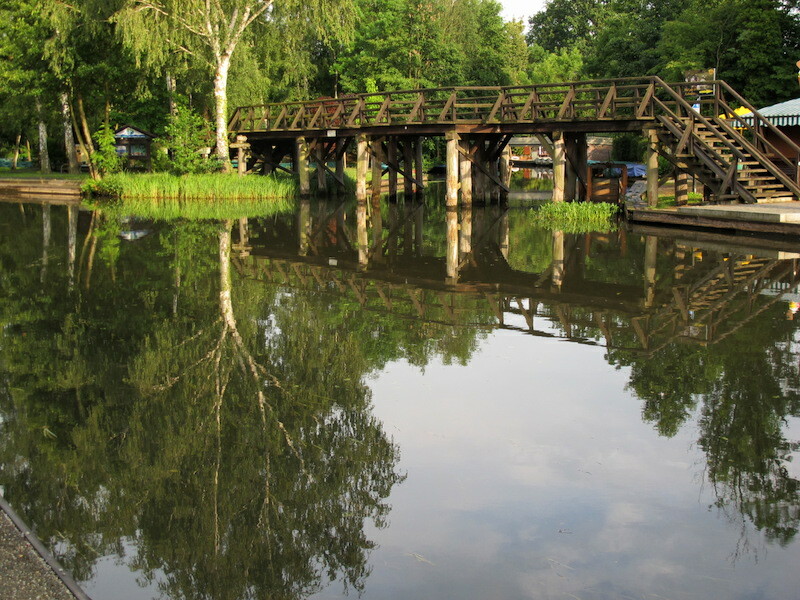 CALAU and the SPREEWALD in the BRANDENBURG REGION of EAST GERMANY. 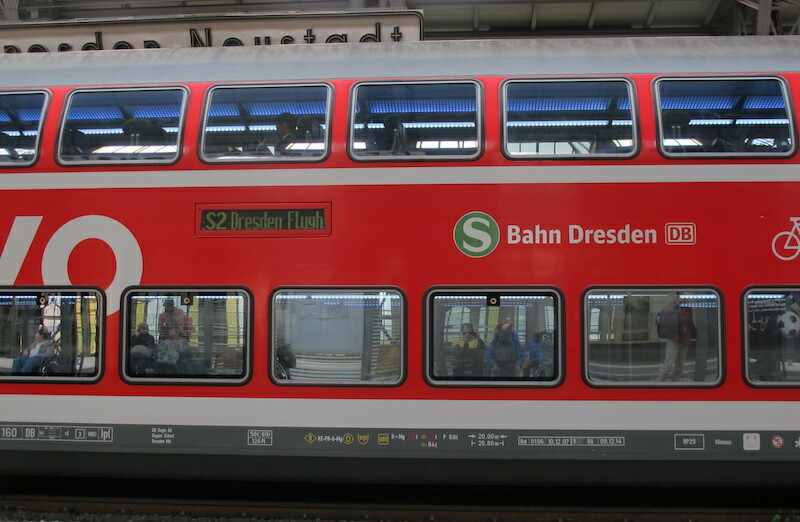 The digital notice board on the Dresden station platform indicated our train would leave at 10-57. Fifteen minutes passed and no train and when Bev made enquiries she was told the train was diverted to another platform and, of course, not being able to understand the language sufficiently we missed the change announcement. Fortunately there was another train in two hours so we sat and waited. 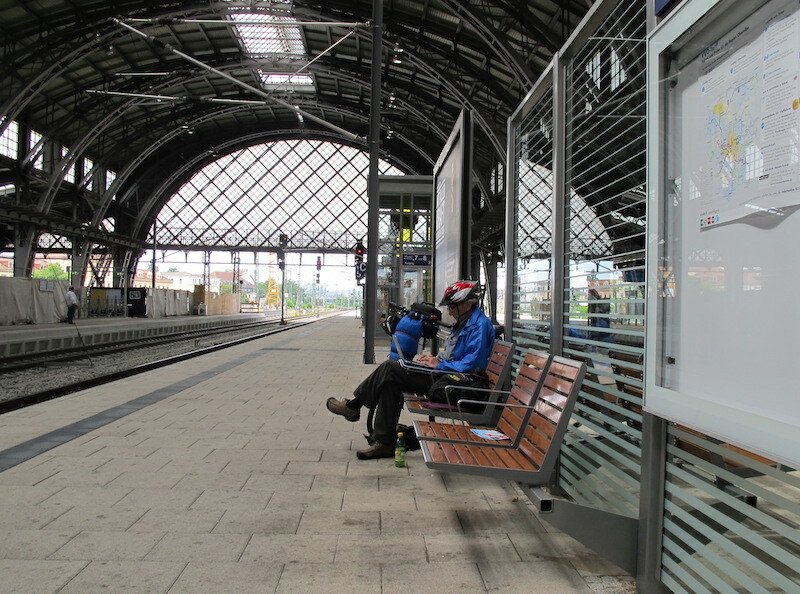 The two hour wait on Dresden station, a good opportunity to write. A train carriage on an adjoining platform. The reflections in the windows are like paintings on a gallery wall, art is everywhere. Thinking of Tbear on the train to Calau. 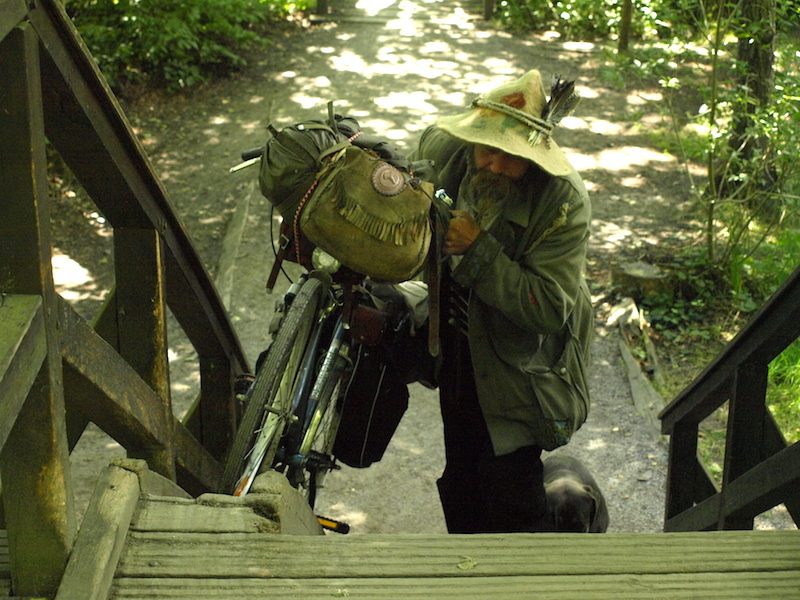 Our friend met us at Calau railway station then it was a short ride to his farm. 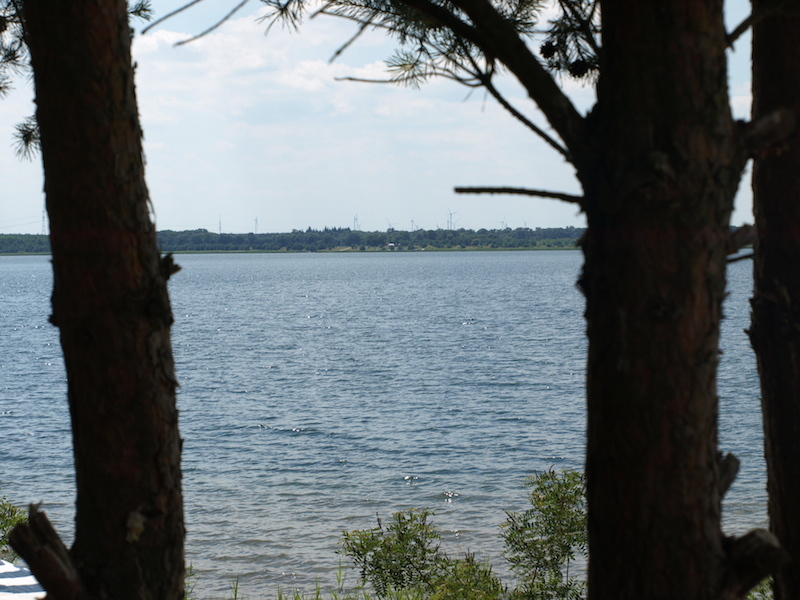 Calau is located in the east of the once divided Germany. There is little industry in the region other than farming and as a result villages and hamlets are very quiet and appear to be deserted. 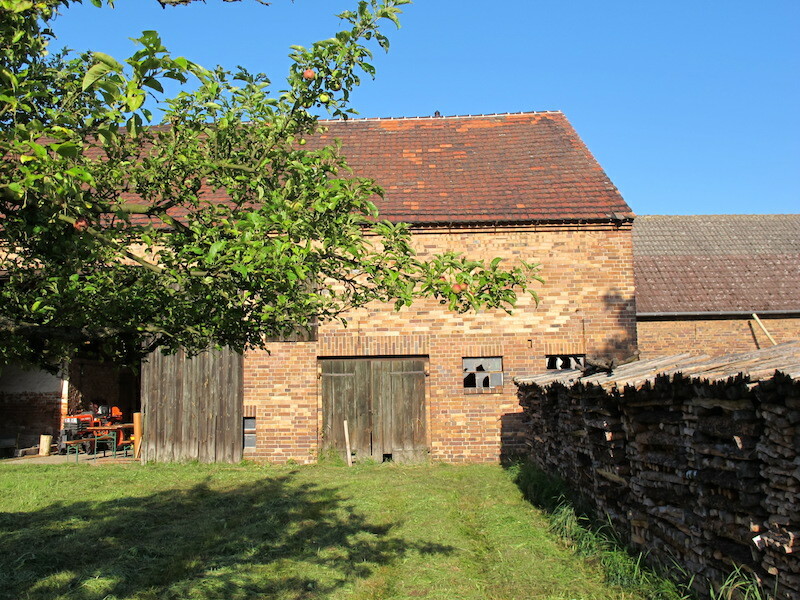 The quietness of the area fits with us well after the hustle and bustle of Dresden…the sounds of roosters crowing, dogs barking and sheep bleating are very pleasing indeed. Rear of the barn on our friend’s farm. On the right is a very serious looking woodpile, an indication of winter temperatures. On the left is an orchard of pears, apples and walnut trees. 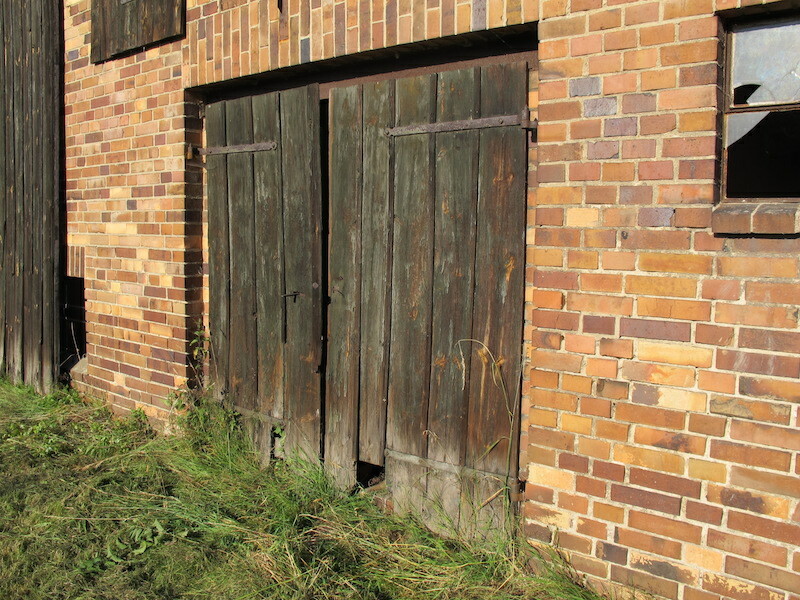 Barn doors. Note the cat hole in the door. 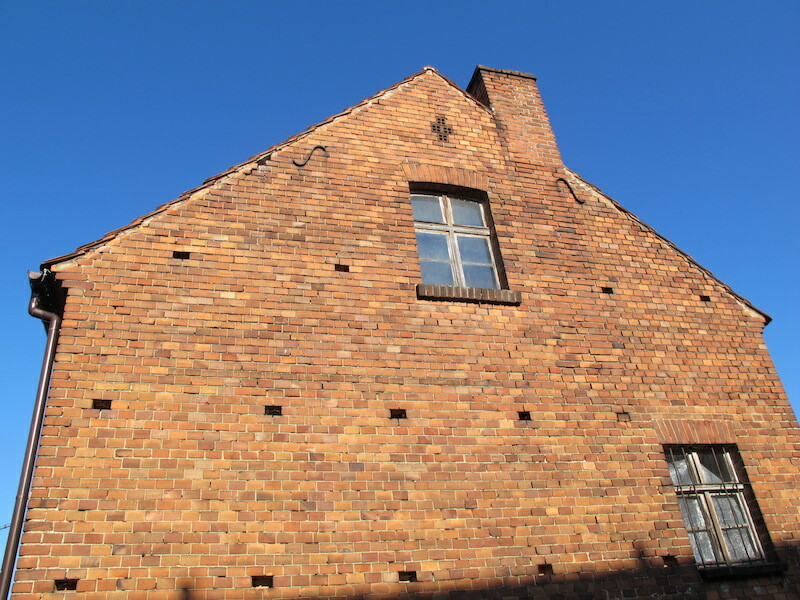 When I photographed the above wall I tried to fathom what type of brick bond this wall was. 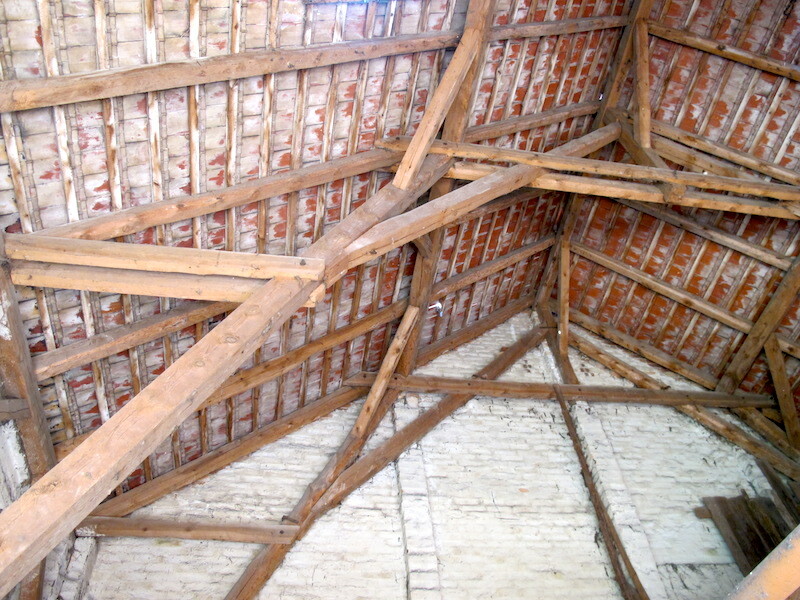 After studying various brick bonds I think it is a mixture of one third running, Flemish, stretcher, English and rat-trap bonds. It looks to me like a variety of brick sizes were delivered to the building site and the brickie laid up whatever brick came to hand. Animal stalls inside the barn that has seen a lot of active service over the years. 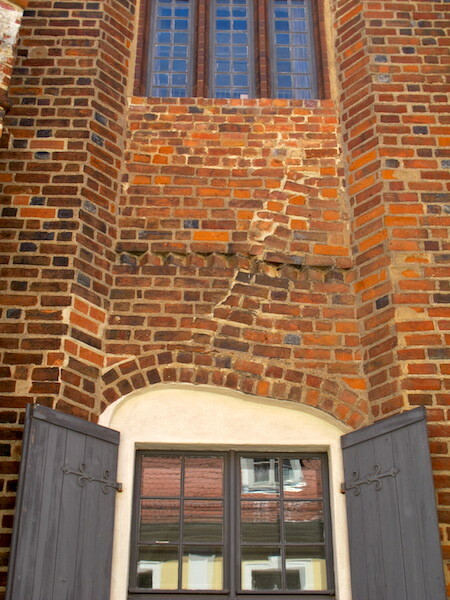 Gable end of the house. 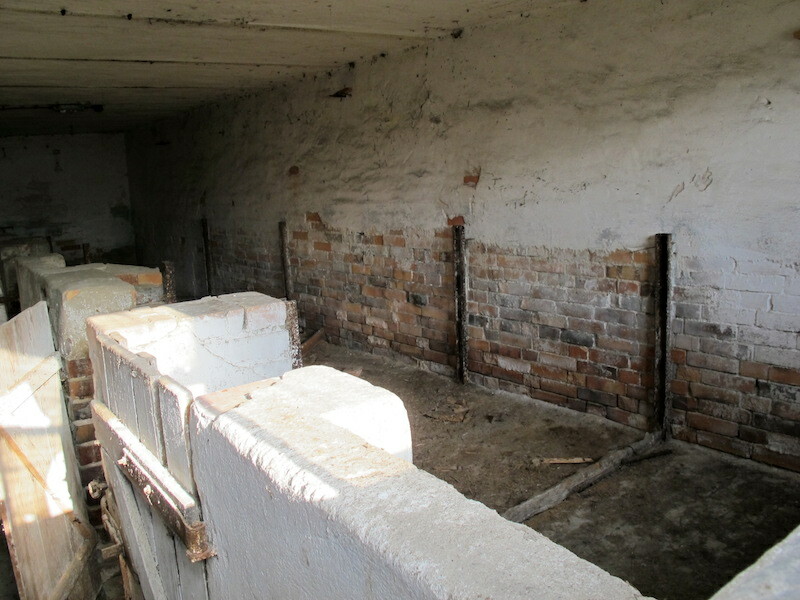 The holes in the wall were where timber scaffolding was placed during construction. The area around Calau is strongly characterized by former open-cut brown coal mining sites, which are now revegetated and are valuable retreat areas for animals. Some areas are so wild that they harbour wolves, wild pigs and deer and regular hunting parties come to the area to indulge their passions. Disused open cut coal mine in the process of regeneration. 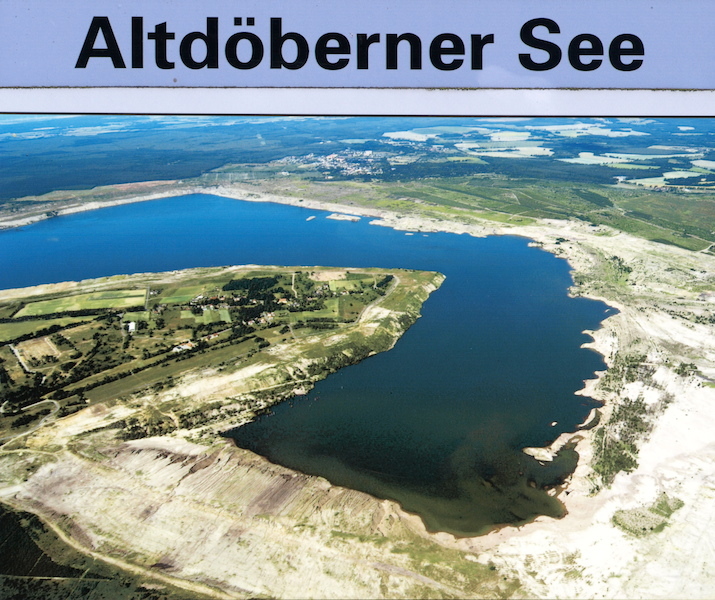 The eroded areas around this lake are very unstable and prone to subsidence and therefore not open for public use. It is estimated that some areas will be out of bounds for at least twenty years. Old mine sites deemed safe are open for public use and we took a ride around one of the lakes. Open-cut mine flooded in 2007. Around the foreshores of Grabendorfer See. On the horizon there are wind-powered generators. It’s good to see new energy-producing sources pushing out the old brown coal power stations. Fuhrlander wind turbine near Grabendorfer See. 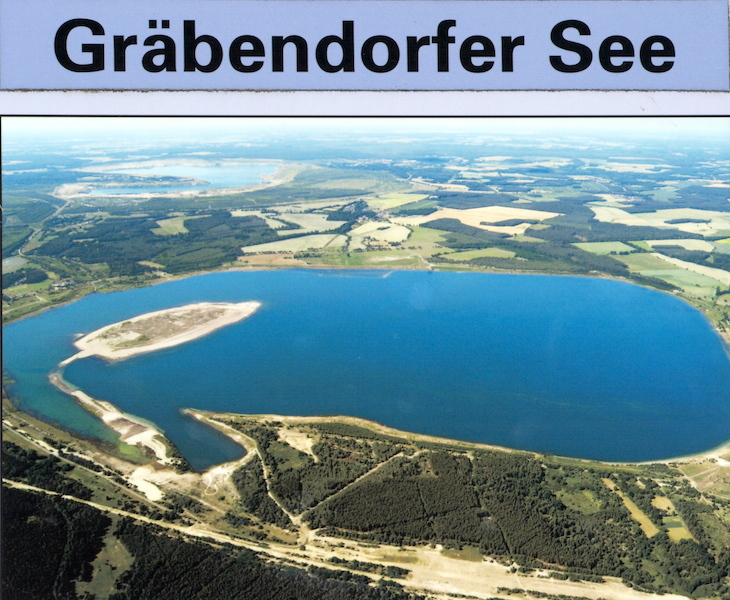 The wind turbine shown in the above photograph was built in 2006 near the village of Laasow. The tower is 160m and the turbine carries a 90m-diameter rotor. 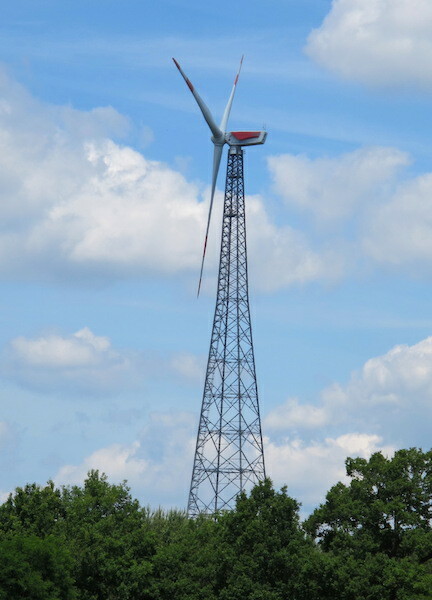 The Fuhrlander is not the tallest lattice tower in the world; the tallest is in Poland and stands at 210 metres. The power output of the Fuhrlander is 2.5 megawatts or, in simple terms, it produces sufficient power to run eight hundred and twenty five average households for one hour. 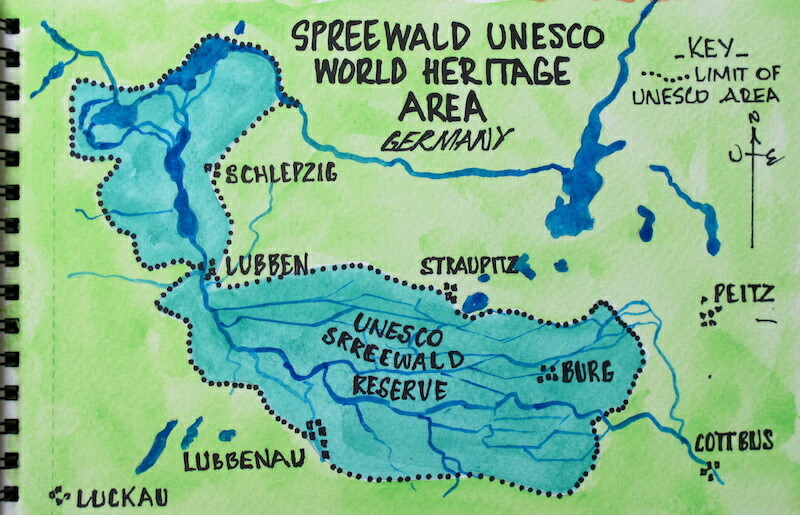 In close proximity to Calau is an area called the Spreewald, a vast wetland area where centuries ago the inhabitants began draining the land. Today there is a vast network of channels and waterways with UNESCO World Heritage listing. 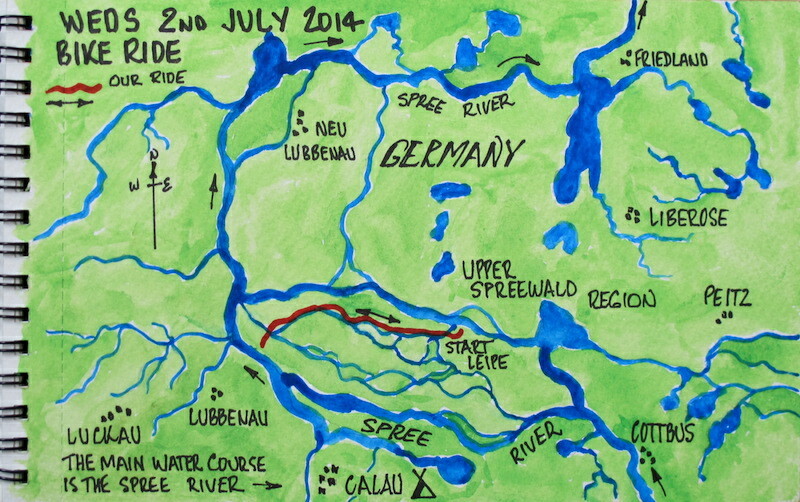 Map showing the Spreewald waterways and our camp at Calau (bottom middle of map). 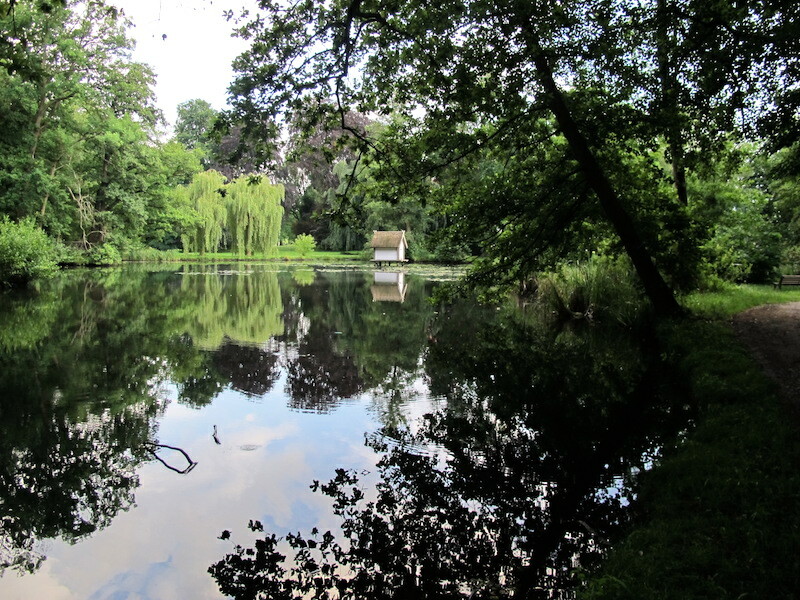 There are vast amounts of water in the Spreewald area and this lake is an example. 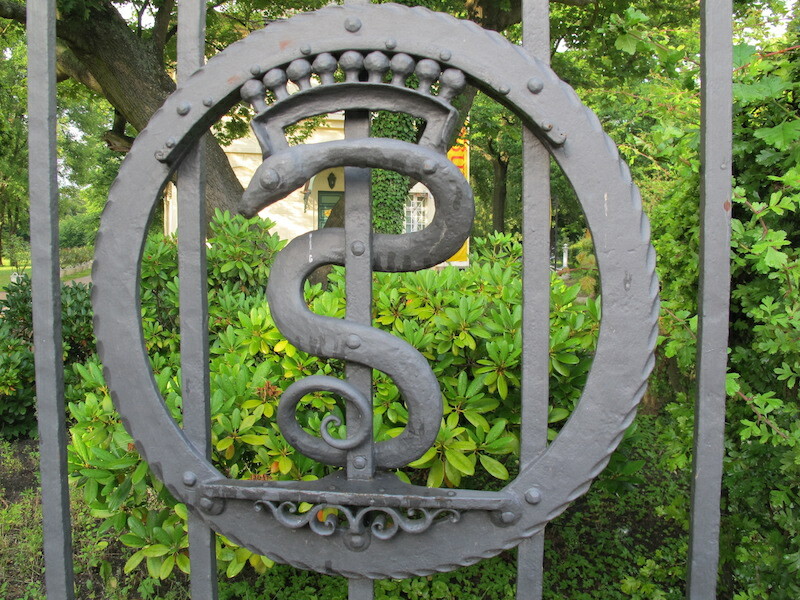 Typical snake symbol on a front gate. Snakes are a good luck symbol in the Calau region. Snake symbols appear frequently on the fronts of buildings and even on house bargeboards. The obsession with snakes probably goes back to the days when snakes were seen as a threat and they were probably worshipped as an act of appeasement. 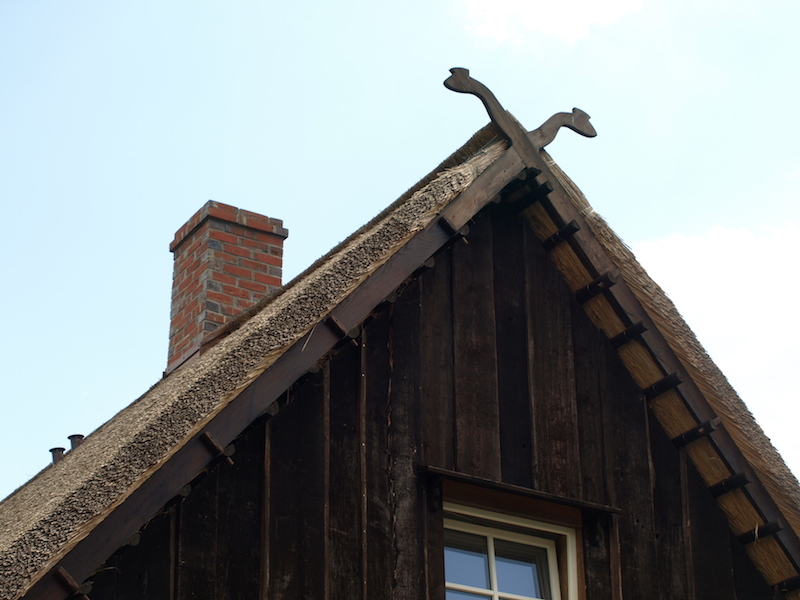 Snakehead finials on the end of a thatched roof house. 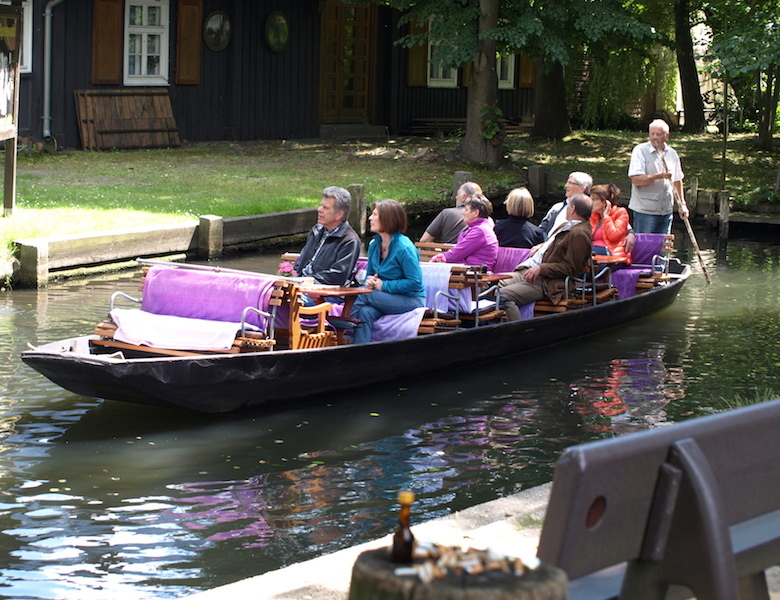 There are three ways to explore the Spreewald…walk, boat/canoe or bicycle. We chose the latter, of course. 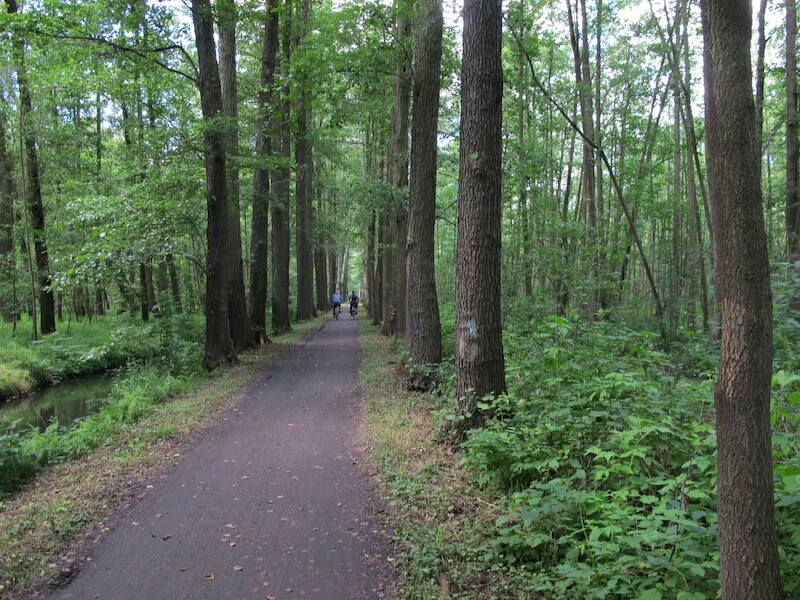 Bike path through the Spreewald. There is a water drainage channel on either side of this path. 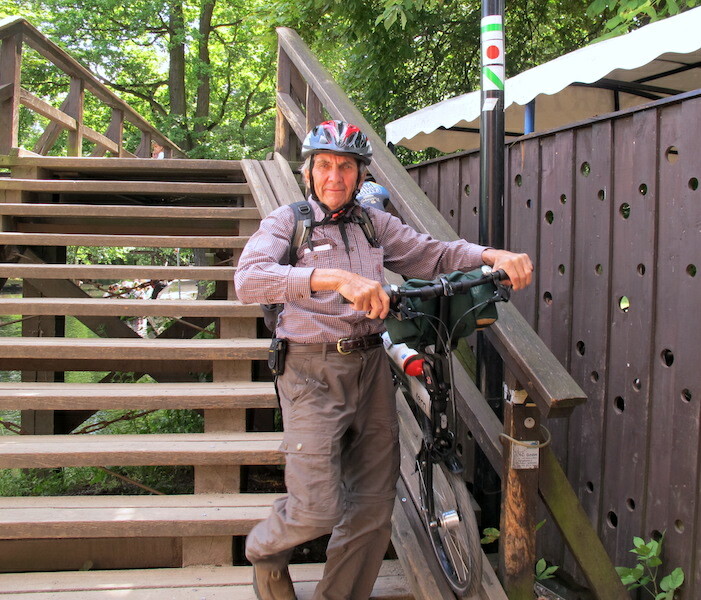 Riding a bike along the paths in the Spreewald naturally necessitates crossing channels. Bridges over the canals have to be high enough for gondola-style boats to pass under and this means cyclists have to dismount and do a spot of pushing up and over. One of the many raised bridges the cyclist has to go over. Tourists passing under a raised bridge. Sometimes we ask ourselves, ‘Are we tourists?’. The answer is no, because we don’t do this! We are travellers! Bev pushing her bike up and over. Tourists don’t do this! 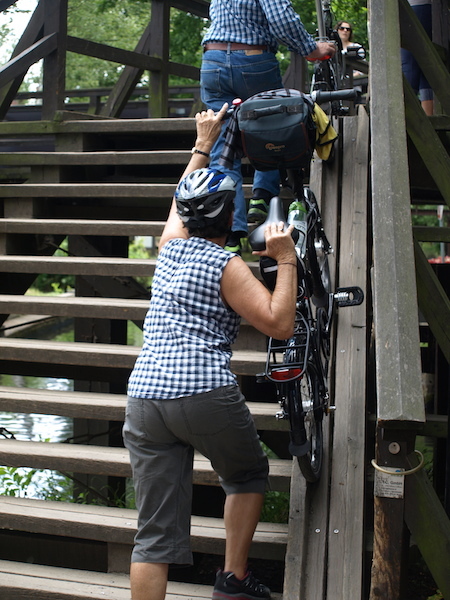 Each raised bridge has a ramp in which the bike wheels go and once in position all you do is push. Coming off the overpass is easy, simply apply the brakes and let the bike slide. 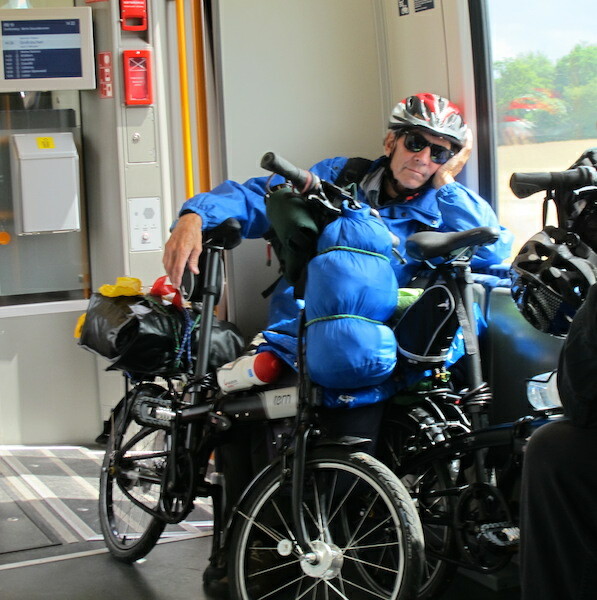 A fellow traveller riding from Austria to the Baltic Sea. 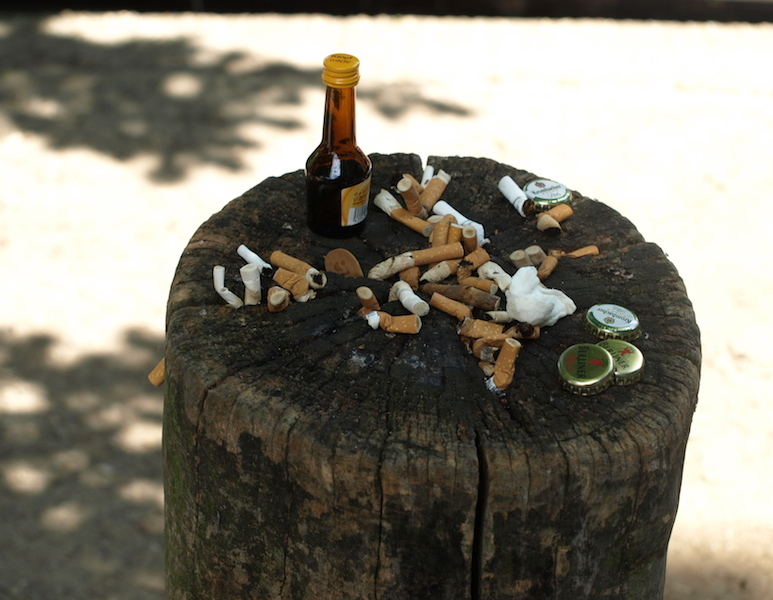 In the foreground there is a small bottle standing on a stump. The next photograph gives you a closeup look. 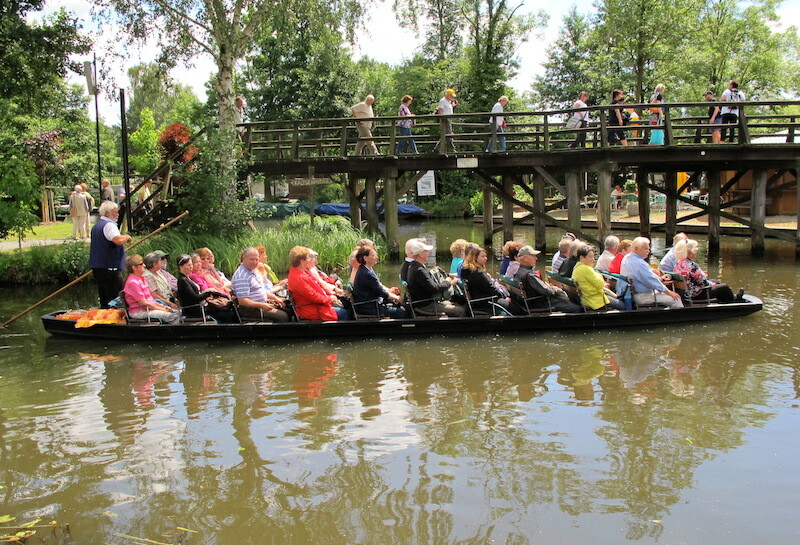 Detritus where tourists board Spreewald punts. Some people have no regard for their surrounds. There is absolutely no excuse for this total disregard for the environment. 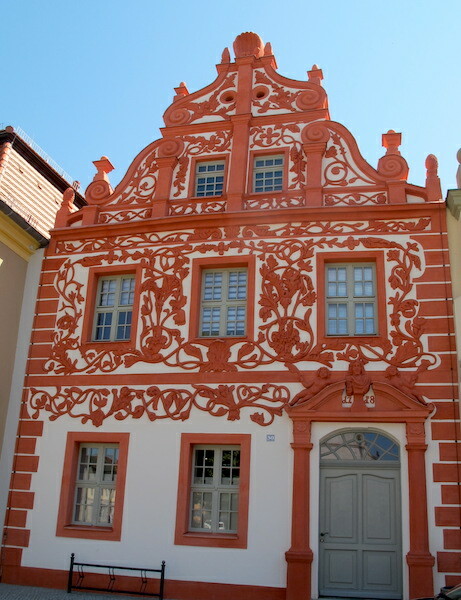 Throughout the Brandenburg state there are many houses and buildings built in traditional style. Since east and west unification many of the communist drab exteriors of the buildings have been prettied up. In communist times there was no coloured paint available so all buildings were drab and dreary. The house in the middle wears its communist coat. And this one has a post-communist era decoration. 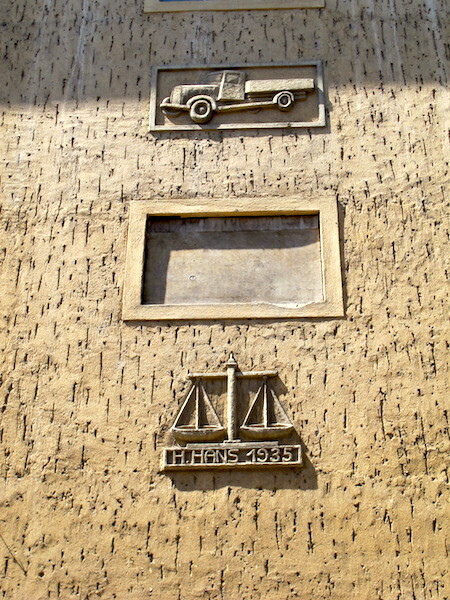 A nice touch on the front of H.Han’s house. I suspect he may have been a carrier known for his honesty. Generally, in the old communist east German zone churches are not in as good a state of repair as in the west and there are several reasons. Religion was outlawed and thus there are a high proportion of non-believers who wouldn’t donate money for restoration. Since the fall of communism monies for rebuilding have been directed into other areas. I surmise that what church rebuilding has been carried out has been with economics in mind. 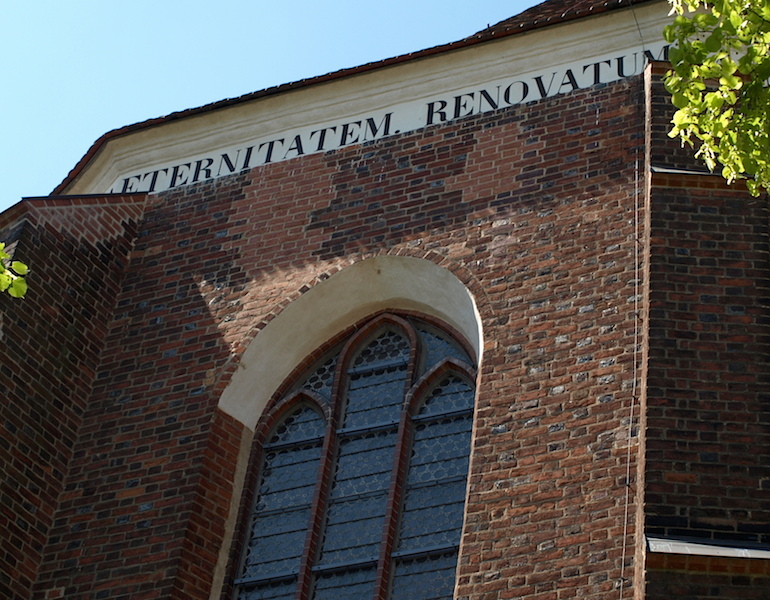 One church exterior we visited was in Luckau where I found the exterior rebuild and the ageing interior fascinating. An inexpensive option is to seal damaged windows. It’s frustrating not knowing why the restoration in the above photograph was done in this manner. Was it simply a matter of economics, unskilled labour or is it a memorial of some sort to damage done during past conflicts? It’s a mystery I may never solve. 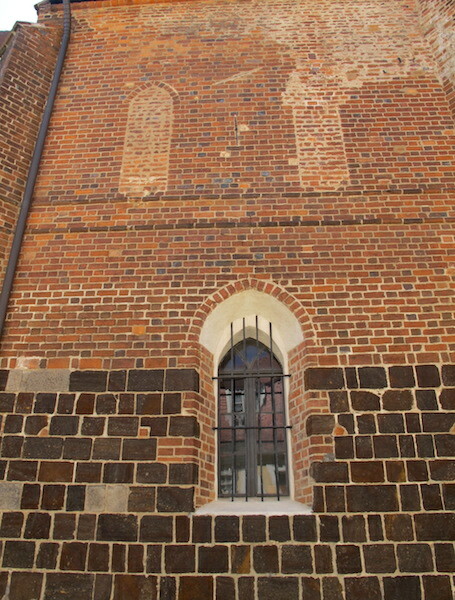 Same church but brick restoration done in a more sympathetic manner. 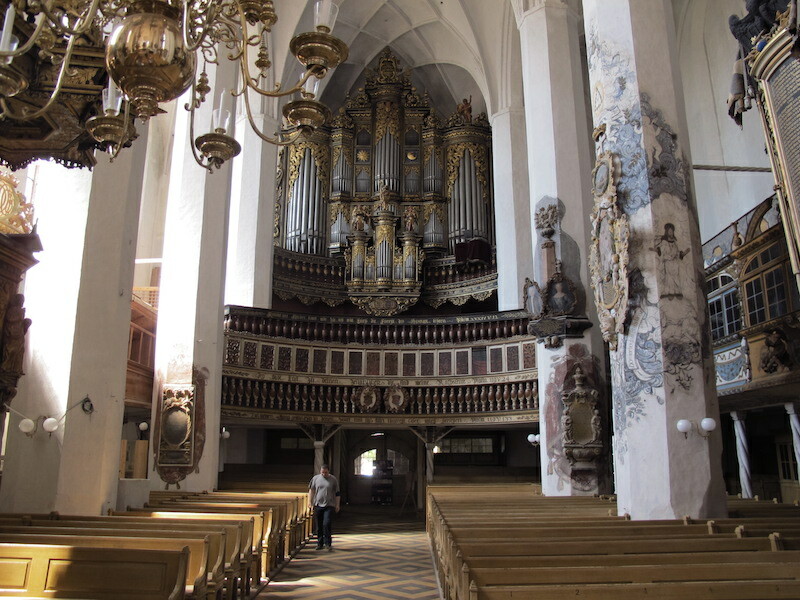 Overwhelming interior of the Luckau church. Our Encountering the Past Odyssey Part 1 began back in 2012 and since then we have visited a hundred or more churches and every time I go into a church I am overwhelmed with the richness of the interiors. Bev and I have asked ourselves on many occasions why we keep going into churches and we think the reason is because they dominate the landscape and thus have a magnetic pull. Another thing that draws us are the priceless art works that fill them, not only paintings but the art of the wood carver and carpenter, the art of the stone mason and artists of the brush. Many churches also tell regional history, and the church we visited today told many stories. For example, above the cloisters were enclosed private boxes for the local gentry. These boxes were enclosed so the ordinary churchgoers seated in the pews below couldn’t see them. Having a private box meant they could stay aloof from the masses. Enclosed private boxes. The adornments shown here show the art of the carpenter, wood carver, sculptor and painter. 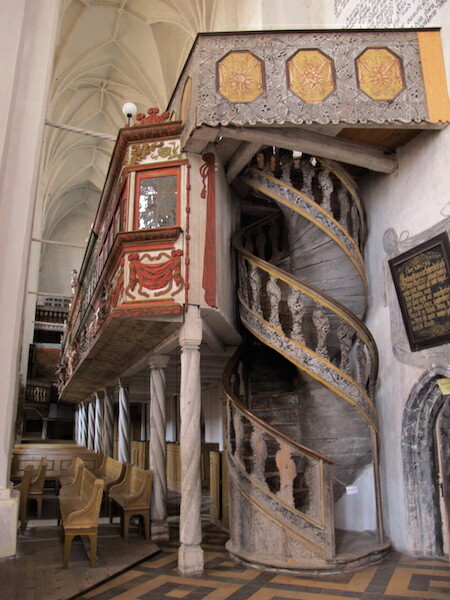 Spiral staircase to the private boxes, incredible precise carpentry. 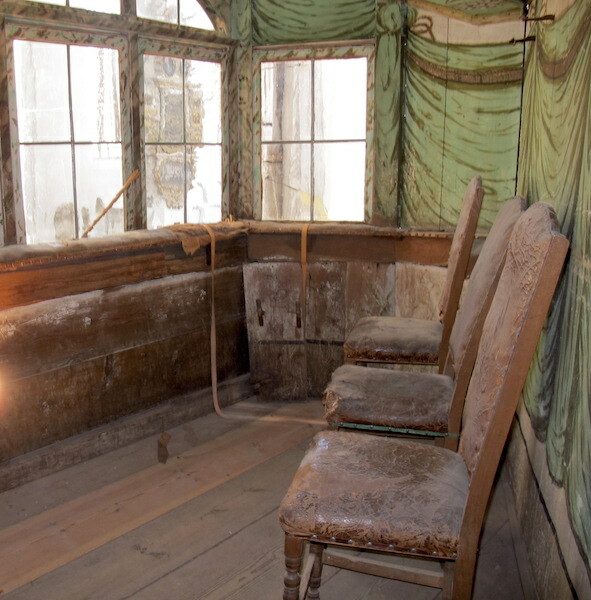 Inside one of the private boxes. Can you imaging the gentry and their ladies sitting on these chairs? 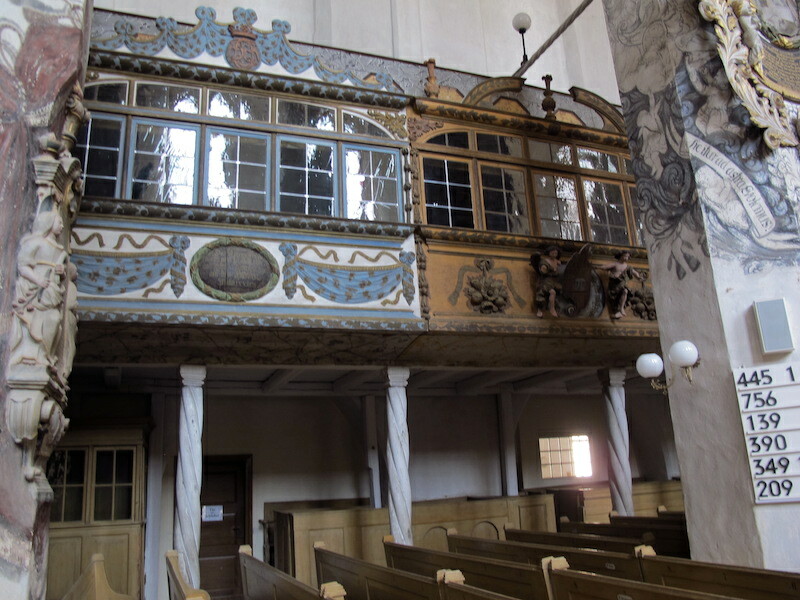 To build and decorate churches like the Luckau church would have cost a fortune, but for the leaders of the church it was money well spent as it drew followers in and having followers justified their existence. The ordinary simple folk came to marvel at God’s creations. They believed that for the craftsmen and artisans to create such complicated and rich artistic work their hands must have been guided by the almighty God. Contemplating the work of ‘almighty God’ might be a good time to end this post. 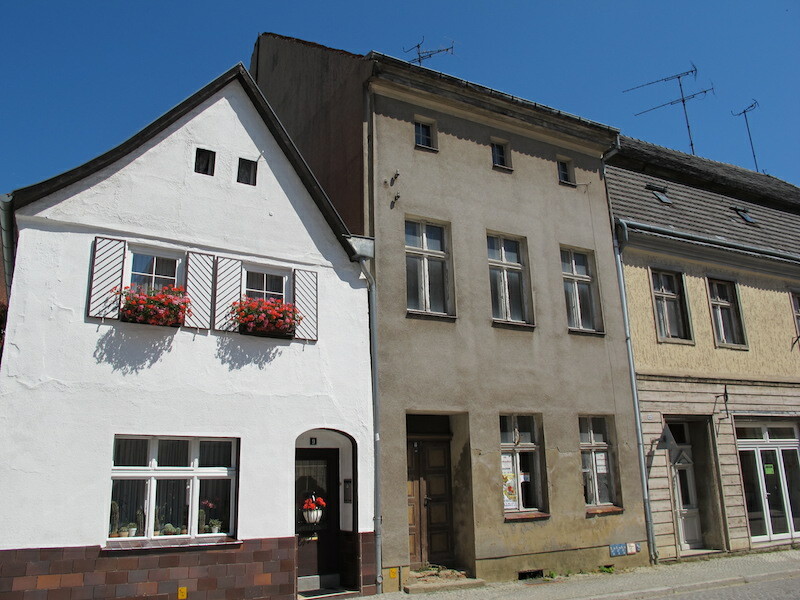 The next post will deal with our move into Poland and part of our bike ride north along the Neisse River. Hi Fred & Bev. Hope the new year is treating you well so far and you are enjoying the grandkids. I am currently at Kennett River (SW-Victoria) chilling out for a few more days. I am trying to catch up on your last lot of blogs as I got very busy last half of year and have 8 still to read. I have an NT teacher friend staying with me ATM who is very interested in your trips – she has travelled extensively and is also a fine art student and has a special interest in pottery so I talked about your (Fred’s) interest and talent in that area. She would like to follow your blogs but I said I ask you first – not sure of protocols etc now. You may even want to discuss pottery etc with her – she has extensive knowledge of ancient eastern forms and the special glazes which identify specific eras. Must admit I knew nothing of all this sort of stuff but was impressed.